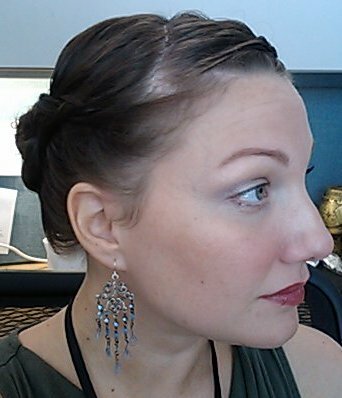 Now that you're a newly-minted Dutch Braid Expert, let's make something just a tiny smidge more complicated... a Twin Dutch Braid Updo! Ok, this actually is super easy. The bonus is that it looks hard to do. I've actually had ladies ask me if I did my hair myself (and this was on a workday... as if I just skipped over to the salon and asked for an updo to get me through my Wednesday). So, hey, anything that looks so pretty that people can't fathom doing it themselves has to be worth sharing! 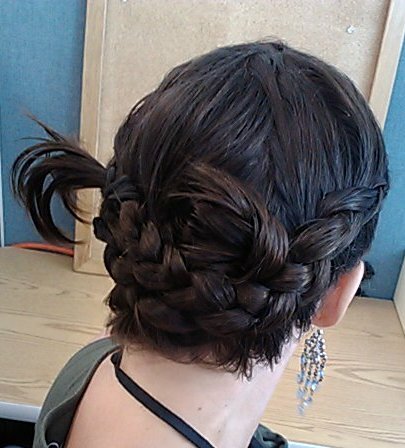 I did this style on my hair while it was still quite damp. Because of that, I don't use any styling products to hold it in place. If you do this on freshly washed and dry hair, you will probably need some styling product to hold it. 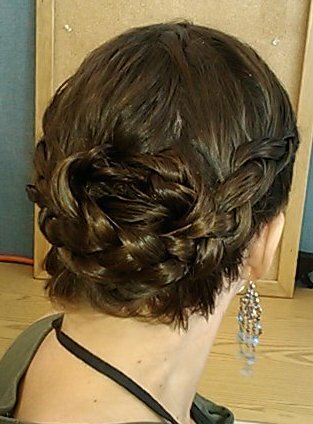 Remember, updos stay better on second or third day hair. 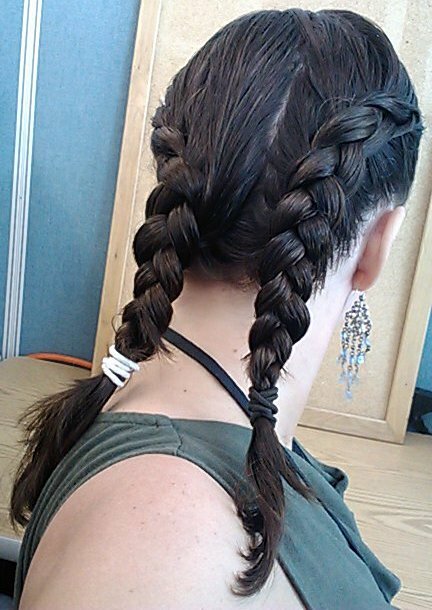 To start, do two Dutch Braids, one on each side of your head, starting at the front, and going to the back, in pigtail fashion. I like to make a deep side part in the very front before straightening and centering my halves. Tie off your braids with a soft elastic. I used two different colors so you could see what I'm doing a bit better, but it doesn't matter what color you use, as we will end up removing the elastics in the end. For ease of writing this out, lets call the part that is braided against your head a "row". We'll call the part that can swing freely the "tail", and we'll call the part that is not braided at the very end the "tassel". OK? OK! Now, take one tail and, keeping the tail flat against your head (don't turn it on its side or twist it, you want the plait pattern to show), wrap it to the other side, without crossing over the other row. 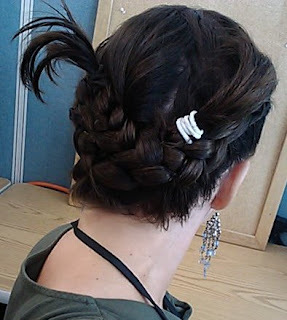 Pin it into place with a couple of hair pins. I use really big hair pins, rather than the usual short ones. In the picture below, I have a pin in my left hand. You can see how long it is. Now take the remaining tail and do the same thing, although you are going to have to cross over the tail you've already pinned up. You don't want to cross over the row, though. You want your braid coil to be resting in between the two rows. Pin this into place. You should have your tassels sticking straight up (more or less) at this point. IF YOU HAVE LONGER HAIR THAN THIS - take the second tail you pinned, force it into a curve, and swoop it over towards its original row. Pin in place. Now take the first tail you pinned, and swoop it the other way. This will criss-cross your tails. If you still have more hair (and girl am I ever jealous if you do! ), then keep swooping it around, but try to end up with your tassels pointing towards the top of your head. Remove one of your elastics (I'm removing the white one first, leaving the dark one (on your left) to be done second). Take a chunk of your tassel, loop it, and then pin the end of the loop in the center of the head, tucking down into your braid coil. Take another chunk of the tassel, loop, and pin in a slightly different spot, but still in the middle. We're creating a little poofy flower looking thing. Don't try to get all the little chunks pinned in place just yet. If you leave some to be finished up at the end, you'll be able to cover any "bald" spots. Do the same thing to the other tassel. See how there are a few pieces still sticking up randomly? That's ok! We're going to fix that! Get those little pieces, and play around with the placement until you like how it looks. On this particular day, my poofy flower bit ended up looking a lot like a heart. So I pinned my extra pieces in place to emphasize the heart shape. Now, if you don't like how that looks, you can pull hair from the braid FROM THE ENDS to fill in your middle pocket thingie. 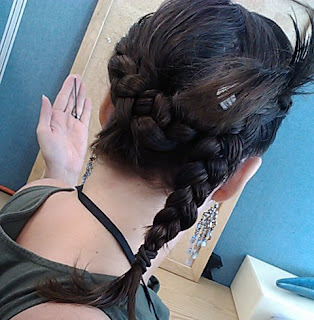 Since your braid is already mostly pinned in place, it is very unlikely that you will destroy your braid by taking just a bit from the last few bumps of the braid. Just be careful! Here is a side view to show you how deep the side part started. You can see that this means the side with the part that is bigger starts getting braided halfway across my forehead. It adds more interest to the style.